2007 Kubota ZD21F Commercial Turf Mower for sale in Springfield, OH. Compton Power Equipment, Inc.
DELUXE SEAT - Designed to offer maximum support and comfort, you'll work longer and with less fatigue when riding on our standard deluxe, link-type suspension seat with armrests. HYDRAULIC LIFT AND CUTTING ADJUSTMENT DIAL - The mid-mount mower is easily raised and lowered hydraulically, while cutting height is adjusted quickly with just a twist of the height adjustment dial. Both controls are within easy reach fromthe driver's seat. CUP HOLDER - Whether it's a hot cup of coffee or an ice-cold beverage, the essential cup holder lets you bring along either one. TILT-UP MECHANISM - The industry's first. 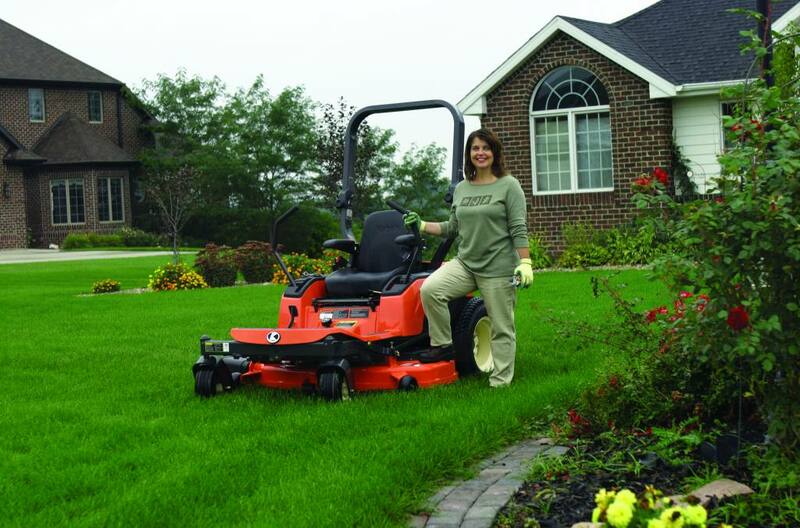 Kubota's unique tilt-up feature allows the front of the ZD-Series to be easily raised to perform periodic maintenance without having to remove the mid-mount mower. It's like having a built-in jack right there when you need it. RollOver Protective Structure (ROPS) - A quick-adjusting, foldable Roll-Over Protective Structure comes standard. It may be folded from 180ºto 90ºwithout tools, and allows you to pass under areas with height constraints. It's the perfect size for easy garage storage. TRANSMISSION - Superior durability of the entire driveline was of utmost importance when we decided to incorporate an integral-type, twin hydrostatic transmission as part of the ZD-Series. The hermetically sealed structure (hydrostat and final drive) requires no maintenance except for an occasional fluid change. And no belt replacement is necessary. CONTROL PANEL AND LEVERS - For convenience, the operator's control panel with throttle, PTOlever, hydraulic lift lever, hour meter, and start switch are all located to the right of the operator, within easy reach. ENGINE - The amazingly durable and fuel-efficient, water-cooled diesel engines on our ZD-Series exceed the high expectations of professional users by being able to take on heavy mowing jobs for extended periods. These engines are all built for the long haul. FULL-OPEN HOOD EASY MAINTENANCE - For enhanced maintenance, the full-open hood provides easier access to the engine and its vital components. SAFETY START SYSTEM - With operator safety in mind, we've designed a safety start system that will only allow the engine to be started when the operator is seated, the parking brake engaged, the PTO is in neutral and the neutral lock is engaged. If, at any time while the engine is running you leave your seat, the engine will automatically shut down. So when the unexpected happens, you'll be protected. PTO CLUTCH - To reduce downtime, the ZD-Series is equipped with a wear-resistant, wet-type, multi-disk PTO clutch thatallows you to work longer, but not harder. With unsurpassed durability, it will smoothly transfer power with absolute efficiency. For safety, the PTO clutch is also equipped with an internal brake, which can stop the mower blades just seconds after disengagement. DEEP FABRICATED MOWER DECK - Time is money, and you'll make more of it, thanks to our new fabricated mower deck. The fabricated design allows you to cut faster—even in tall, thick, wet grass—with our extra-deep 5.5" deck. SHAFT DRIVE - No belts. No pulleys. The direct transfer of power from our shaft drive is smooth. Plus, our shaft drive's low-maintenance operation makes it the most dependable choice. MULTI-V-BELT/CAST-IRON PULLEYS - Heavy duty cast-iron pulleys and a multi-V-belt make for a virtually wear resistant mower drive system. BELT COVER - Providing quick access for service, our belt cover allows for easy maintenance plus protection against the elements. SWIVEL ANTI-SCALP ROLLERS - To prevent unsightly turf damage, we equipped our mower deck with two independentlyfunctioning, anti-scalp rollers that rotate a full 360 degrees. 7-GAUGE STEEL MOWER DECK - Thanks to our mower deck's fabricated design—which allowed us to construct it from heavy-duty, 7-gauge (4.5mm thick) steel—it also offers incredible strength and durability. It's high-grade, commercial caliber, all the way! NEW BLADE - For a higher quality cut and enhanced performance, we equipped our ZD-PRO zero-turn mowers with sharper blades that hold their edges longer. EASY-TO-ATTACH/DETACH MULCHING KIT (OPTIONAL) - Not satisfied with your mulching results? Then our pro mulching system was made for you. Made from thick, strong, 10-gauge steel, our high-performance, dedicated mulching system produces super-fine mulch. Plus, it lets you mow faster while using less power. NEW MULCHING BLADE - Forged from high quality steel, our mulching blades are incredibly sharp and hold their edges longer. FLAT MOWER DECK - Faster cutting is nothing if it doesn't look great. That's why, to ensure a superior cutting performance even at faster speeds, our mower deck utilizes both a flat design and our new baffling system, which forces grass through all 3 cutting blades as opposed to just one. FEATURES - 1. Patent pending baffle design ensures grass of being repeatedly cut before flowing into the second blade. 2. Unique baffling when forces grass clippings into the second and third blade, where it will be cut and re-cut before being evenly discharge. 3. A smaller discharge opening forces grass to be re-cut by the third blade prior to final discharge.